My very first concert tour after nine years of recovery from an attack of polio in 1955. The tour offer came unexpectedly, and I told no one connected with the tour about my polio experience. The tour reviews surpassed my wildest dreams. When I was offered further tours in the US and Europe, I felt compelled to warn the tour managers, Sherman Pitluck and Mark Bichurin, about my post-polio status. But they were undeterred, and even persuaded me to let them share my story with others. Continuing to tour in the US and Europe, I also was invited to join the music faculty at Immaculate Heart College in Los Angeles. Since I had taught private students for many years, beginning at age 13, I was delighted to join this interesting and open-minded faculty. I was also able to pass along techniques I’d learned during my recovery from polio — techniques which were also helpful to students with “normal” piano-playing equipment. During this period, I particularly enjoyed playing the Beethoven Concerto No. 3 on tour with the Royal Philharmonic in the US. “I came away more satisfied with Carol Rosenberger’s playing (comparing adjacent performances by Carol Rosenberger and Wilhem Kempff). She played with much greater exactitude than the veteran German, her ornaments were more tasteful, and she integrated her playing more successfully with the orchestra.” (Beethoven’s Concerto No. 3). After taking some time out (in 1969) for more post-polio physical therapy, I plunged back into touring, and made important appearances in New York, Paris, and London. The concert in Paris was especially poignant for me. The revered Nadia Boulanger, “Mademoiselle,” came to the concert and we had an emotional reunion afterwards. She was very moved to hear me play fifteen years after I had been knocked down by polio. I had been studying with her 15 years earlier, in 1955, right before the polio struck, and she had done everything possible to help me at that time. 1970 also saw a first performance with Neville Marriner, who at that time was Music Director of the Los Angeles Chamber Orchestra. “Carol Rosenberger played the graceful, grateful solo with tremendous fluidity, poise, and clarity.” (Mendelssohn Concerto in ‘a Minor for Piano and Strings). A high point in the 1971-72 season was my first-ever appearance in New York’s Carnegie Hall — a mecca for classical musicians. I returned to London to play at Wigmore Hall, and also performed for the first time in Boston’s beautiful Jordan Hall. Other standout appearances were with the Houston Symphony, and a “sentimental return” to my native Detroit to play with the Detroit Symphony. Music Journal and McCalls published articles about how I had found my way back from polio. “in every technical respect she proved herself to be a master, including excellent pedal technique and sheer power. Her performances have an unforced quality that has nothing to do with strength. Rather her playing draws on an inner calm. Her contrapuntal articulation was admirable in not forsaking legato. (Stravinsky Sonata) … One of the richest aspects of her performance was the subtle range of contrast she drew between the agitated and more stately Preludes. It makes good sense to perform Chopin’s 24 Preludes as a group, and Miss Rosenberger did so without suppressing the character. In 1973, I began recording for the fledgling Delos label, (DE 1635, Szymanowski Masques and Etudes). Delos was the brainchild of the remarkable Amelia Haygood, then a practicing psychologist, who was also a lifelong classical music devotee. Amelia’s mission in forming Delos was to give American artists an international platform. (Everyone in the classical music business told her she was crazy to try such a thing.) Also in 1973, I joined the music faculty at California State University, Northridge. Other highlights of that period were playing the Chopin Piano Concerto #1 with American conductor James DePreist and the National Symphony Orchestra, and playing on the Eastman Great Performers Series. Around that same time, MS Magazine published an article about me, and in 1974, when I played at Lincoln Center in Tully Hall, the MS staff, headed by Gloria Steinem, sent me a delightful note ahead of time. They all came to the concert, placing themselves in the front rows so that I couldn’t miss seeing them and feeling their support. A wonderful moment! “She proved herself to be a soloist of nuance and individuality.” (Mozart Concerto in G Major, K. 453). “Carol Rosenberger brought marvelous fluidity to the bitter-sweet languor of the inner movements. She met the high velocity challenge of the outer movements deftly, too.” (Shostakovich Concerto No. 1). In 1976, I participated in another Delos recording, a Hindemith album featuring The Four Temperaments, with London’s Royal Philharmonic Orchestra and conductor James DePreist. That same year, I also recorded more solo music of Szymanowski — his fascinating set of 22 Mazurkas. Also in 1976, I was asked to represent America’s women concert artists by the President’s National Commission on the Observance of International Women’s Year. UCLA invited me to do an interesting “residency,” which included a workshop with their music students and two solo concert evenings (one all-Beethoven, and the other all-Polish, featuring Chopin and Szymanowski). In 1977, I received an offer to join the University of Southern California Artist faculty. In addition to working with young pianists, I conducted a Preparation for Performance workshop each semester. In these workshop/classes, which were called “Psycho-Physical Aspects in Performance,” I shared with music students the techniques I’d learned over many years of polio recovery and private teaching. This involved a wide range of young performers, both instrumentalists and vocalists. 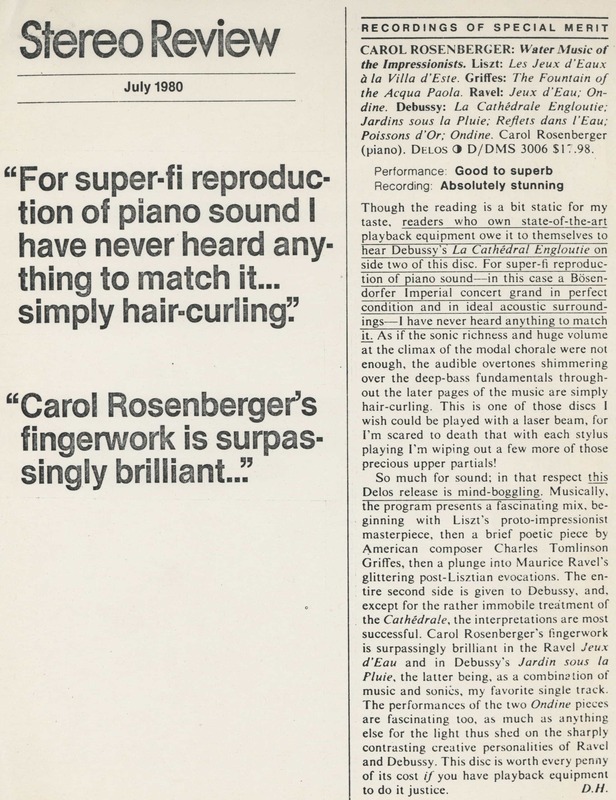 When Stereo Review published a survey by Music Editor, James Goodfriend, entitled “All the Young Pianists,” I was surprised to be the only American woman included in the survey. On my birthday, November 1, 1977, I played in Tully Hall at Lincoln Center in New York. Another memorable concert for me was my first at USC’s Bing Theater in 1978. “Rosenberger’s Delos digital recording⎯Water Music of the Impressionists⎯an absolute must-have disc, is the best piano recording I’ve ever heard. Her playing is notable for her sense of what is different in each work, her ability to blend intricate subtlety with sweeping power and grandeur, to build and hold tensions within a work, and like Martha Argerich and precious few others, her ability to do it all without resorting to pounding the piano for that extra bit of emphasis … a psycho-acoustic effect was caused by the stunning excellence of the Delos recording, and by Rosenberger’s musicianship and sensitive use of the full capabilities of a superb Boesendorfer Imperial. In late 1982, I got together with the great clarinetist David Shifrin and other principals of the Los Angeles Chamber Orchestra to make a recording with boy soprano Bejun Mehta, who was the son of a longtime friend of mine. I couldn’t imagine a more authentic version of Schubert’s “Shepherd on the Rock”! “A splendid, large-scale recording. 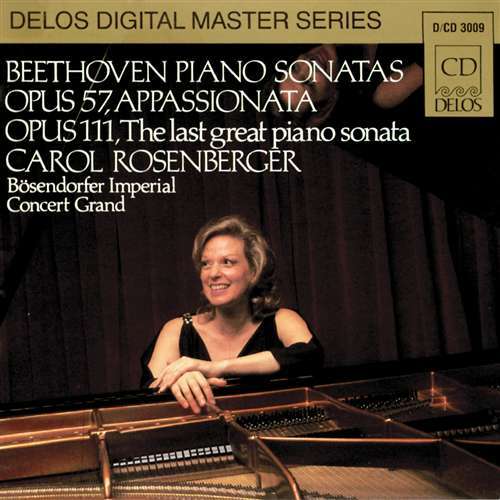 Carol Rosenberger is a formidable talent, and her performance of these Beethoven piano sonatas is powerful and intense. In 1983, I played a solo concert at New York’s 92nd St. Y. At the end of the program I had Bejun come out onstage to do a couple of “encores” with me. My goal, of course, was to introduce this phenomenal young singer to NYC audiences. It was also great fun! In 1984, I began my official “Recording Producer” role at Delos, working on what the legendary recording engineer John Eargle called “the other side of the microphone.” John, who had written the “bibles” on sound recording, had joined Delos as the label’s Executive Engineer. The occasion of my Recording Producer debut was a Liszt recording with the great American pianist (and my dear friend), John Browning. Co-produced DE 3145, Todd Wilson’s “In a Quiet Cathedral,” and wrote an introduction to the program. Amelia and I, who both remembered quiet moments listening to an organist playing in an empty cathedral, had suggested the program to Todd as the organ equivalent of my “Perchance To Dream” calming album for children and adults. Baby Series began. I had always loved finding the right musical sequence for a program of musical selections, and particularly enjoyed choosing and sequencing the selections for the discs on this series. Touring with Moscow Chamber Orchestra, in a concert at Town Hall in New York City, and in many performances all over the US — from Alaska to Florida. Touring in Europe with the Moscow Chamber Orchestra. Helping to produce recordings with artists such as Dmitri Hvorostovsky!